Bhadrachalam, popularly known as ‘Dakshina Ayodhya', and ‘Bhadradri' is famous for its celebrated pilgrimage shrine 'The Sree Seetha Ramachandra Swamy Temple'. It is situated in Khammam district, in the state of Andhra Pradesh, 312 kms away from Hyderabad. Situated on the east bank of the Godavari River, the shrine is of great mythological significance. The place was associated with Maharishi Bhadra, who had performed penance at the bank of the river Godavari and Lord Rama appeared and gave mercy to Bhadra.That is why the village is named Bhadrachalam (Hill of Bhadra). Another significance is that, according to legends, Lord Rama during his 'Aranyavasam' lived here before Ravana carried away Sita. The Sree Seetha Ramachandra Swamy temple marks the spot where Rama crossed the river. It is dedicated to Lord Rama. Also known as Bhadrachalam temple, it was built by Kancherla Gopanna (Bhakta Ramadasu), the governor of Bhadrachalam under 'Abulhasan Qutub Shah' the last ruler of the Qutub Shahi Dynasty. Kancherla Gopanna is said to have appropriated funds from the treasury for the purpose, and was subsequently imprisoned. It is said that Lord Rama appeared before the Sultan and paid the money spent by Kancherla Gopanna. After this incident, Gopanna adopted the little of Ramadasu. He had sung songs in praise of Lord Rama. Kabirdas, the famous Muslim saint and poet, was also closely associated with this temple. Despite the beauty of its natural setting, the temple is of little interest architecturally having been substantially rebuilt in recent years. One have to climb 50 steep steps to reach the temple and it is entered through an impressive gopura. On the top of the Gopura one can see Sudarshan Chakra, the weapon of Lord Rama. Legends says that it was found by Bhakta Ramadas from the Godavari River. At the main entrance there is a small sanctum dedicated to Anjaneya. The temple premises is well maintained and clean. There is a dwajasthamba, in front of a hall. One have to pay special tickets of Rs 10 to enter the next hall which is closer to the sanctum. The shrine houses an unusual, Lord Rama is holding a bow and conch with Sita seated on his lap and near to him Lakshman holds bow and arrow in hands. At the temple complex, there are shrine dedicated to Goddess Lakshmi, Consort of Sri Vishnu, a Rushya Mookham exhibition which displays dieties ornaments, (Fee: Rs.2/-), a 'Yaaga Shala', idols of Alwars (Sri Vaishnava Saints) and a Nitya Kalyana Mandapam. The temple's main festival are 10-day Vaikunta Ekadashi (Dec/Jan) and Rama Navami (Mar/Apr). 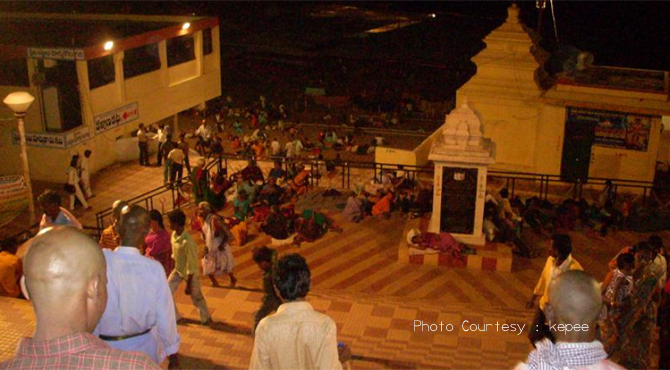 During these days, the town attracts lakhs of people. On Vaikunta Ekadashi day, the colourful Teppotsavam(boat festival) is a special attraction to the devotees. In the evening, Lord Rama and Seetha idols kept on a decorated swan boat and sailed through river Godavari. Spectacular fireworks is the main attraction during this festival. For more details contact Ph: 08743-232428. The Ushnagunda (Hot Pool) is located only a short distance from the Temple. It consists of a hot spring that emerges when the sand at the bottom of the river is disturbed. And Parnasala, 35 km north of Bhadrachalam, is believed to mark the hermitage where the demon Ravana abducted Sita. Apart from a pilgrim place, the town offers other tourist destinations like Coringa Wildlife Sanctuary, Rajahmundry, Eluru, Warangal, Guntur, Nellore, Srisailam, etc. In Bhadrachalam, tourists can engage in activities such as boating, trekking at Papikonda ranges.